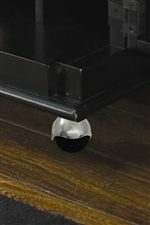 Throw the perfect Superbowl party with is ravishing entertainment center. This 48 inch wide media center will display your big screen TV with essence. There are two doors with adjustable shelves behind each and two adjustable shelves and one fixed shelf in the center opening. The center compartment is great for displaying stereo equipment, DVD players, video consoles and other electronic equipment. Neatly organize all electrical devises in on the shelves and store accessories on the shelves behind the doors. 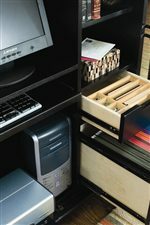 DVDs, CDs, video console equipment and entertainment objects can be stored in those compartments behind the doors, allowing your to keep the entertainment always looking clean for those unexpected guests. The graceful curved legs and angular edges provide variety and character to this media center. 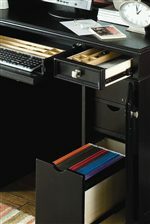 The lateral composition of this cabinet will provide any room with movement. Accompany this entertainment unit with an end table to complete your entertainment room. Friends and family will be stunned by your complete and unique room setting. The Camden - Dark Media Center 48 Inches by American Drew at AHFA in the area. Product availability may vary. Contact us for the most current availability on this product. Finish & Paint Options Finishes are naturally resistant to minor everyday hazards and accidents. Handles & Hardware Brushed Nickel Finish Hardware. 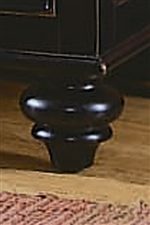 The hardware on this furniture has been protected with a clear lacquer coat. 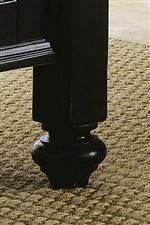 Case Detail Turned legs provide a traditional style giving the furniture subtle details. 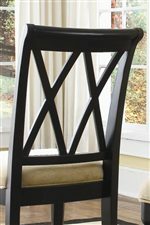 The Camden - Dark collection is a great option if you are looking for Transitional furniture in the area.